I originally planned on doing this way back in May, but by the time I got around to it, the place had pretty much cleared out (much like the graduation! ), but since I promised it and one of your faculty council members has recently raised the topic as one in need of discussion, I thought I should post the chance for people (now or in the future) to make some suggestions about next year’s graduation while this year’s is still a good ways off. Just in case you missed it, last spring’s was better in some ways than the year before (no stifling hot weather, no three hour wait in the parking lot) and I really, really liked the fact that faculty and students were staged in the same area together, so I had the chance to see and interact with our graduating students before the ceremony started, at least. Even still, it’s hard to say that the ceremony was a “success;” one commentor mentioned the de facto faculty boycott of the district wide event–I counted 24 HW faculty members proceeding in with the students. Others volunteered. Even including them, though, I’d guess that most expected it to be long and frustrating, and so avoided it. The students who went were, for the most part, practical in their approach. Here is the picture I took from my seat at the moment the Chancellor said, “I now officially confer your degree” etc., and asked everyone to move their tassles from the left to the right, you know–when everyone throws their hats in the air in the movies. You might recall that I was sitting with HW students and we were at the very back of the floor. So, all of that space in front of me is the space where the graduates from the six other colleges had been. If you look up to the stands on the far left, you can see that they are empty, too. The worst part is that the few people in the picture were all faculty marshals. If there were 50 students in the building at that point, I’d be surprised. And if we keep increasing the number of degrees we give out, it’ll only get worse. Finally, I kind of miss the fact that the people who earned Basic and Advanced Certificates (and GED degrees) used to be included, but aren’t anymore. And I really missed hearing the rocking HW student ensemble on the recessional. So, in that spirit, I’d like to suggest that graduations go back to local campuses. The different colleges at Universities hold separate graduations all the time. Why not us? Failing that, I have no solution to the degree conferral issue other than universal conferral, with simultaneous later pick up/individual recognition. If we did that, the whole thing would be over in less than an hour and it would be much more celebratory. Also, as our Valedictorian suggested, maybe some music in the parking lot to keep spirits up? And maybe an email to the faculty announcing where to be and when, if invitations and instructions are not going to be distributed with the gowns (as they once were). Any and all others can go in the comments. I’m sure someone will take notice…though, the board report on the event suggests that everyone was pretty happy with how things went. I suppose it’s all relative. It was certainly easy to get to a bathroom at the end of the ceremony. Beyond that, I’m not too sure I would classify it as a ‘success.’ But maybe that’s me. Last year, when Don had his first open meeting with faculty, I raised my concerns about graduation with him. Since he hadn’t been to a HWC-only graduation prior to his arrival, I tried to paint a picture for him about how great it used to be. I told him my greatest hope would be to “take back” our graduation. Restore the fabulousness that was prior to the district-wide yawn fest that we are now subjected to. Yes, it was a smidge better than last year, but it was still pretty awful. After the mayor told his story, comparing his infected finger with the lives of our students (yikes!) and then running off the stage before the applause ended, we did have the pleasure of the Valedictory speaker (she was amazing-and a CD student, to boot). The rest is a hazy mess. Since it is clear that we are not going back to campus-by-campus graduations any time soon (if this is about money then I get it, no other reason makes sense) then we need to move to a ceremony like the one I graduated from at the University of Wisconsin. 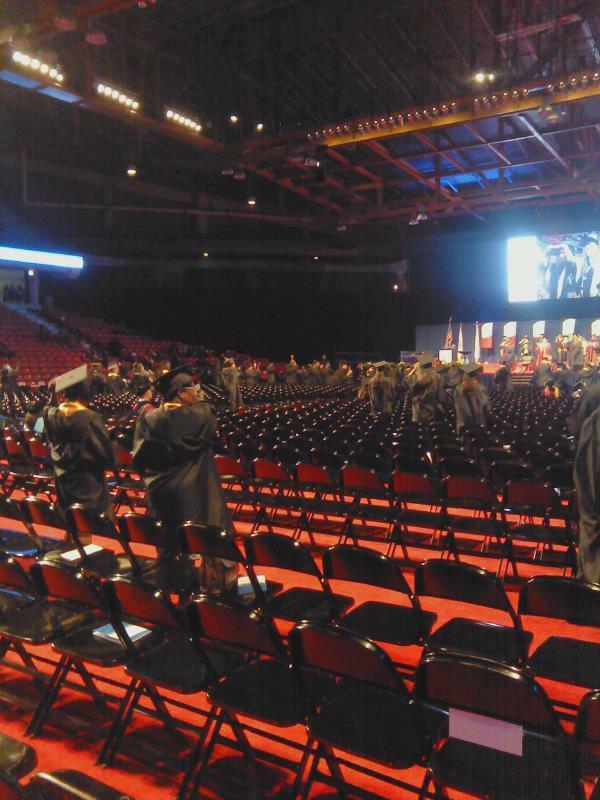 All students graduating with an AA degree, stand-up, sit-down. All students graduating with an AGS degree, stand-up, sit-down, etc. In 10 minutes all of the graduates stand up, sit down, degree conferred, finished, go home. It is not very personal but it is the only solution to a graduation that confers degrees on more than 300 students. I really wish the Chancellor had attended one of our graduations back when it was at the Chicago Theater or the Lyric. Remember when we would dress at the college and walk over to the theater, en masse, in our caps and gowns. There was time to meet our students’ families and really celebrate with them. I knew so many of the people walking across the stage. We sat together (we were all there) and laughed and cried about our students successes and glory. It really was magical-definitely my favorite day of the year. Remember how the Distinguished Professor spoke about our campus and our students and his/her experiences at HWC? Those speeches were uplifting and invigorating (think Armen Sarrafian, a few years back). Now that our sick days are not worth anything, I think faculty participation will continue to slide. I think there will be a wide-spread flu come May….so sad. Chancellor Hyman was at the last HWC graduation–at Symphony Center. John Wozniak introduced me to her because I was at the front (or back) of the faculty line as a marshal and happened to be next to the administrative contingent. It was a month and a half after her appointment. I think she may have gone to all of them that year. Also, I believe the district office is on record as saying that the collective graduation is MORE expensive than the separate ones, specifically denying that it’s “about the money.” I don’t remember where I saw/heard that, but I distinctly remember the claim being expressed and my surprise at the disclosure of it. So… that means she saw how great it was and she is still insisting on this??? It doesn’t make sense to me. (Inquisitive Response) Maybe the other graduations were less awesome. (Cynical Response) Or maybe she’d rather attend one than seven. (Generous Response) Or maybe she hoped that combining them would allow for one grandiose spectacle of the sort that the seven colleges could not make happen individually (i.e., getting Mayors to speak rather than the GM of the Palmer House for example) and so celebrate the students in a splashier, bigger way. If I remember correctly, I was told that Hyman didn’t like having to attend all of the graduations, – like it was necessary for her to do so. Someone failed to inform her that in the past the Chancellor did not attend them all – Watson sent Vice Chancellors to most of them. So her decision to unify them was to help her out in the situation, to make it easier for her. It was not to build unity among our sister colleges.